Meet Dr. Ryan DeRosa, one of the newest additions to our Astrophysics Science Division. His research is pretty out there, and we mean that literally since he aims to detect cosmic reverberations from billions of light-years away. He started out working on the massive, L-shaped gravitational wave detectors of the Laser Interferometer Gravitational-wave Observatory (LIGO). But here at Goddard, he’s focused on recording ripples in space-time via a different means: a really big and really sensitive space-based antenna, also known as the Laser Interferometer Space Antenna (LISA). Dr. DeRosa ultimately hopes to measure the repercussions of black hole mergers, test the extremes of gravity, measure the expansion of the universe, and maybe even hear echoes of the Big Bang. Q: What are gravitational waves and what can they tell us about our cosmos? A: Objects in the cosmos emit different forms of radiation, including visible light, infrared light, and X-rays. Collecting and analyzing this light — which is created as particles are accelerated through space — can teach us about the specific processes that generate the radiation, and inform our understanding of what the universe contains and how it has grown. As it turns out, when you accelerate mass there is another kind of radiation emitted: gravitational radiation. This is not a wave of light, but rather a wave in the curvature of space-time — a fluctuation in the distance between points in space that stretches and squeezes the fabric of the universe. But space-time is hugely stiff; it is not easy to squeeze or stretch. Even very energetic events only create tiny signals. We need massive, compact objects moving at high speeds to generate a strong enough signal to measure. That means the systems capable of producing detectable gravitational radiation must be composed of interesting objects, present at the extremes of physics. These are violent cosmic events occurring in the depths of space — for instance, the collision of two black holes which had been orbiting around a common center of mass. Events like binary black hole mergers — truly great catastrophes — convert an enormous amount of mass into energy, yet they might not even emit any light. As a result, these signals could pass right through our planet unnoticed if it weren’t for gravitational wave detectors. Q: What insights did your previous research project, LIGO, reveal about gravitational waves? A: The LIGO observatories began detecting gravitational waves from binary mergers in September 2015. Prior to LIGO, scientists were able to confirm the emission of gravitational radiation as described by general relativity, by measuring the decay in the orbit of a binary pair of neutron stars (the Hulse-Taylor pulsar). So we knew these kinds of signals existed before 2015. But what sets LIGO apart is that it observes the gravitational wave disturbing the distance between proof masses here at the Earth, without relying on the distant source producing any light at all (although it is hoped to see events in both spectrums in the future). This is a big step in and of itself. It’s also an added treat that the first few signals were from quite interesting systems: not binary neutron stars but binary black holes. These results told us that stellar mass black holes can form into binaries and proceed to merge within the lifetime of the universe. We also found that the black holes involved were a bit overweight compared to the ones previously detected through X-ray observations. Black holes have a wide range of masses, and our LIGO observations demonstrated that the population of relatively large ones — with masses a few dozen times the mass of the sun — appear to be more common than expected. All that, and LIGO’s astronomy output is only just getting started. 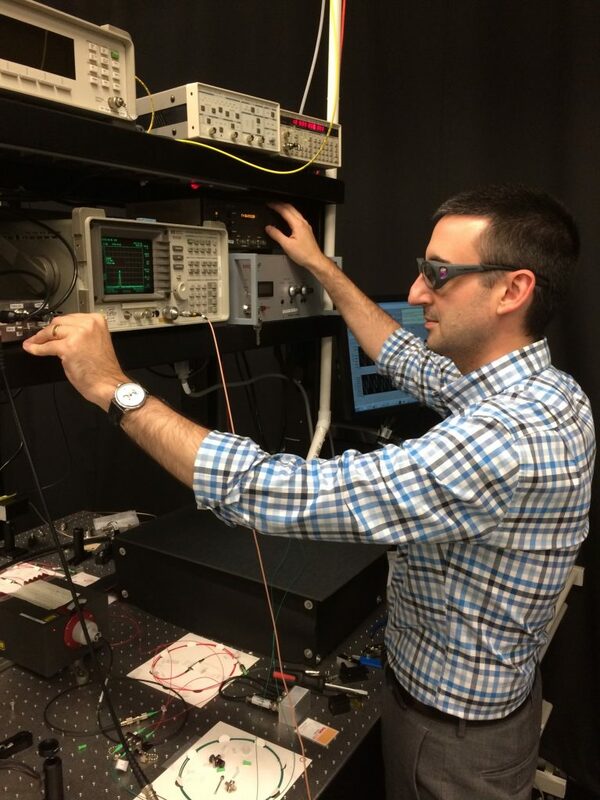 Ryan DeRosa phase-locks the lasers in Goddard’s LISA metrology experiment. Q: What are you working on here now, and what do you hope to learn? A: A trio of satellites called LISA is being planned as a joint mission between the European Space Agency (ESA) and NASA, to bring gravitational wave detection into space. LISA will be a 2.5 million-kilometer-long antenna, which will follow Earth in its orbit around the sun. This effort dates back decades, and has had some starts and stops, but many people have stayed the course and a new LISA mission was officially proposed this past January. At Goddard, we have a strong mix of LISA involvement, including technology and instrumentation development, data analysis preparation, and signal modeling/phenomenology. I am firmly placed in the first category, working with other scientists and engineers on designing and testing the equipment NASA will contribute to the mission. We plan to study many different types of systems with LISA, but I will briefly introduce two. When two supermassive black holes collide, they produce a nice gravitational wave signal and likely drag entire galaxies with them. LISA can hear these signals even if they come from systems very far in the past. By measuring the rate at which these events occur and the masses involved, we can piece together a history of galaxy formation and evolution. In addition, LISA will help us measure the gravitational waves from stellar mass black holes whipping around supermassive black holes at the center of a galaxy. This allows us to test extreme gravity situations. If we can identify the galaxies hosting these kinds of systems, we might be able to gauge the expansion rate of the entire universe. Q: What specific area of gravitational astrophysics do you think is emerging as the “next frontier”? A: In this field and at this point in time, we are experiencing many firsts — so almost anything we are able to produce constitutes some kind of frontier. When each new piece of information represents a significant fraction of everything you have learned to date, it is very difficult to predict what the consequences will be in the future. With a mix of detectors operating at different frequencies, like LIGO, LISA, and Pulsar Timing Arrays, the whole gravitational wave spectrum is the frontier. Ryan DeRosa says he only plays one sport these days: baby chasing. 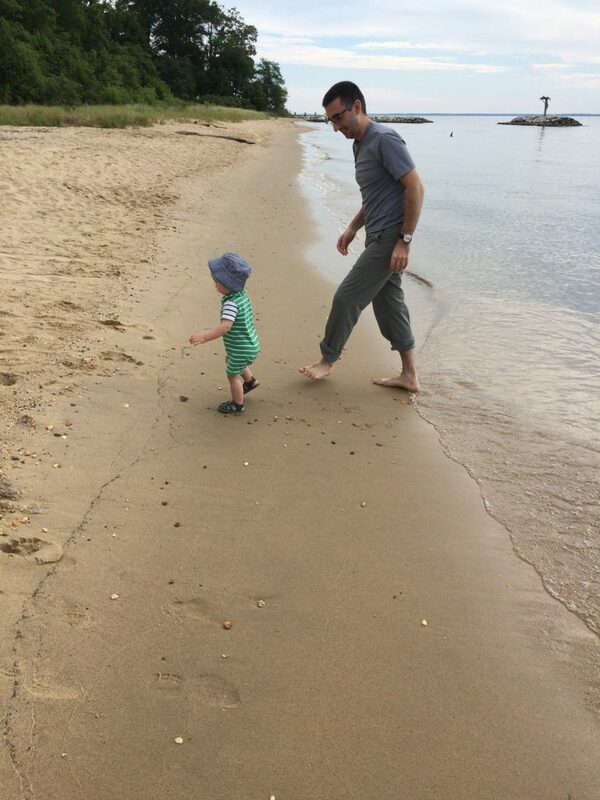 His son is 16 months old, and he and his wife enjoy spending their weekends outdoors, either hiking or on the coast. Q: If you weren’t an astrophysicist, what would be your dream occupation? A: Like a lot of people at NASA, if you ask what my dream job is I will tell you that I am doing it. If I think about my hobbies, the only one I know of which can really be done as an occupation is the manufacturing of whiskey. Bourbon more specifically. Unfortunately, all of my attempts to date have been bad. Quite bad.